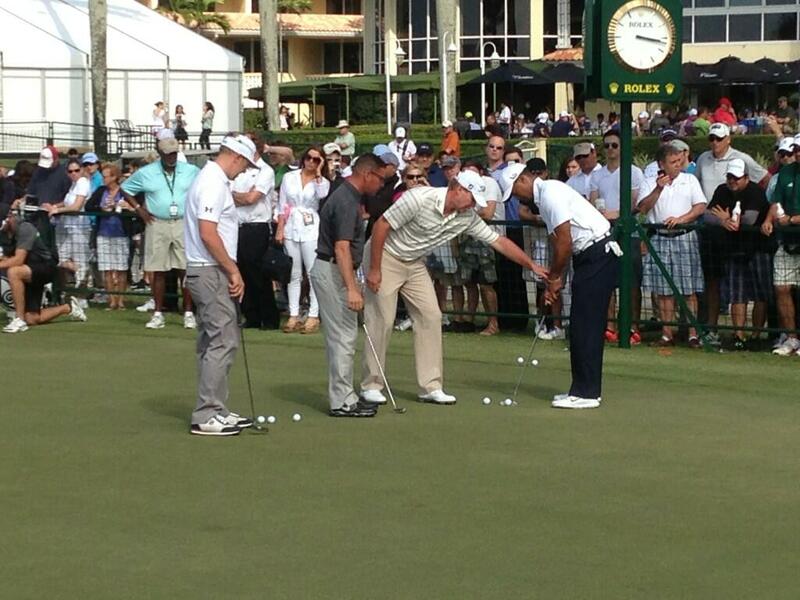 Steve Stricker lost $620,000 by giving Tiger putting advice. Graeme McDowell lost $100,000 by double bogeying his final hole. I should know not to get frustrated when it comes to reading tweets from Darren Rovell, but that’s exactly what happened yesterday when the above missive was re-tweeted into my timeline. I’ll get the truth out of the way first: technically, Graeme McDowell’s missed putt on 18 cost him $100,000 when he dropped from a solo third finish into a tie for third with Adam Scott, Sergio Garcia and Phil Mickelson. Of course that’s also ignoring his 273 other shots during the week that contributed equally to his final score, including several missed putts on Sunday, but I’ll let Rovell slide on that one. Where I take issue with him is in his suggesting that Steve Stricker’s putting advice that he gave Tiger Woods on Wednesday, as seen in the above picture, somehow lost him money. The $620,000 he mentions in his tweet is the difference between Woods’ earnings of $1.5 million for winning on Sunday and Stricker’s $880,000 for finishing as the runner-up. I”ll give Rovell credit for punching in the numbers correctly on his iPhone calculator, but as usual, he’s missing the point. Badly. Stricker’s impromptu lesson was a focal point for many throughout the broadcast, as Woods was having the best putting performance of his career. His 100 putts over the four-day event is his lowest total ever. To put it in perspective, the 25-putt average per round from last week is almost four putts better than his career average of 28.81, so obviously Stricker’s advice was helpful, but to say that Stricker lost money because he gave him some tips is ludicrous. Yeah, I guess I do. But it’s just like I’ve said all week, it’s kind of the nature of our game. Older players have done it with me, and I’m now one of those older players I guess, and when somebody asks me for their help, I tend to give it to them. You know, Tiger and I have always talked about putting, and you know, he had me look at him again this week and you know, some things clicked with him it looked like, and he was really excited about what he was doing there. But he’s got a lot of talent. Like I said, he might have done this without my help. But it’s good to see him. It’s good for us. It’s good for the TOUR, and I’m happy with the way I played. Of course, listening to Rovell’s opinion on golf is much like taking advice from the guy who just made triple bogey, but swears that he knows how to “get your swing on plane”. However, the story has led many to question Stricker, suggesting that the lesson was in bad form, and that he should have just let Woods figure it out himself. As usual with a good portion of the mainstream media who cover golf, they like to pick whatever side of the argument suits them at the time. John Hawkins of the Golf Channel even admits halfway through the piece linked above that he’s contradicting himself, but proceeds to suggest that Stricker shouldn’t have given Woods the lesson because even though golf is a game of tradition and honour, you still “play to win the game.” Yet, if we had somehow found out that Stricker refused to help him out, this same media would be ripping into Stricker for not upholding the values of the game, the same way that he and Woods were taught how to play in the first place. Jack Nicklaus has relayed a story in the past of a practice round he played once with Arnold Palmer when he was first starting up on the PGA Tour. Nicklaus was short of the green and decided to chip it on, getting it to about seven or eight feet from the cup. Palmer, eleven years his senior, asked him why he decided to chip that ball instead of putting it, with Nicklaus replying that he always chipped from those spots. Palmer then asked him if he would have been satisfied with a putt that ended up seven or eight feet away from the cup, which Nicklaus obviously said no to, and from then on out, Nicklaus used a putter from just off the green when the situation called for it. Did that make Nicklaus a better player, and save him a few shots every now and then? Maybe it did, but Palmer just wanted to help the kid out, even though he knew that he was going to be his biggest threat down the stretch of his own career. What happened on Wednesday afternoon was nothing out of the ordinary, but it was made into something big because of the players involved and the end result. If Stricker finishes tied for 20th, we probably don’t hear much about this, but it’s a trivial issue anyway. Stricker doesn’t regret doing it, and clearly Woods wasn’t too proud to ask, with the known friendship between the two making the conversation much more approachable. Stricker helped out a friend who asked and we were treated to some of the finest golf possible by two of the best players of the last fifteen years, and as usual, we’ve got something to complain about. You can’t please everyone, I guess.